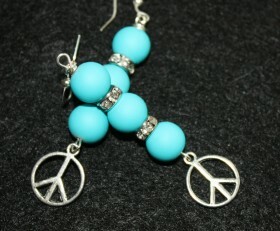 Peace Signs never looked so bright in these beautiful statement earrings. Bright turquoise beads with bling spacers and silver peace signs make these earrings the perfect accessory and ones everyone will notice. Very unique. Also available in hot pink beads. Select your bead color at checkout. Categories: Motorcyle Lovers Jewelry, Neon Jewelry, Shop, Yoga / Zen Life Earrings, Yoga / Zen Life Jewelry.